"House for mother" is the first house completed by Förstberg Ling, a project started in 2013 as a part of the housing exhibition in Linköping, Vallastaden 2017. The house is conceived as a dwelling and studio for Björn's mother Maria, librarian and an enthusiastic weaver. "House for mother" is a house that balances spatiality with intimate rooms - formal simplicity with strong materiality. 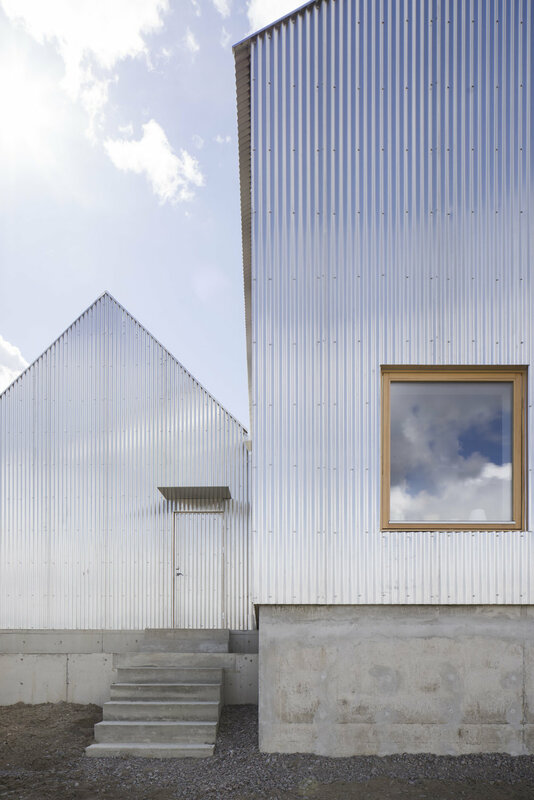 The facade in raw corrugated aluminium creates a variable play with light and shadow during the day, a rich materiality contrasting with it's simple expression. The wooden beams and trusses along with the walls lined with plywood give warmth to the interior. The concrete floor is a durable and beautiful surface for everyday use, folded to a low bench along the perimeter of the building. The division of the house into two volumes, slightly shifted from each other, emphasizes how narrow the plot is. While standing in the open for now, the future urban context will eventually not expose much more than the gables to the neighborhood.